Projects are useful for grouping and categorizing time entries that belong to the same type of work. Projects make it easier to analyze data, generate more useful reports, and see where and how you spend time. Each project typically belongs to some client, but you can create a project without a client (e.g. internal company stuff). Keep in mind that a client can have many projects, but a project can belong to only one client. 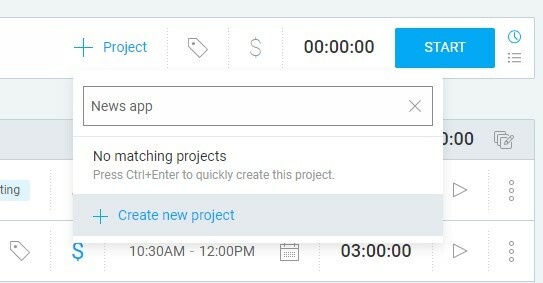 Once you’ve created a project, you can select it when tracking time. If you’ve set the project as private (visible only to a certain user group), then only people who are on the project will be able to select it when tracking time. You can also add a project directly from the Time Tracker page while creating a new time entry. Click on the “+Project” field to get a drop-down list of projects and start typing the name of your new project. Once you start typing the drop-down list will try to suggest a matching (existing) project name. If that project does not exist you will be offered the option to create a new project. Click on the “+ Create new project” button and a popup window with additional options will appear allowing you to name your project, assign a client, apply a project template and select if the project will be public or private. If you’re an owner or an admin, simply go to Clients, enter client name, and click Add. Set “Who can create projects and clients” to Everyone (regular users still won’t be able to see the Client’s page in the sidebar, but they can create clients when they create a new project or when they edit an existing project). Once you complete a project, you can archive it, so it’s no longer visible when tracking time. To see archived projects, click the Active filter at the top of the page and change it to Archived. To restore an archived project, click three dots next to it and select Restore. When you have a lot of projects, it can be difficult finding what you need. That’s when filters come in handy. You can filter projects by client, users who are part of it, billability, and name. You can sort projects alphabetically by clicking Project˅˄ on the header of the project table. If you have a lot of similar projects, it’s a good idea to set up a template so you don’t have to create the same project over and over. Projects you create with an existing template will have settings such as Billable Rates, Estimates, Tasks and Team already applied. Project templates is an extra feature, which you can enable once you upgrade your account.